You might know that I am in the middle of moving house. We are still looking for a place, but I already started packing and I am trying to let go of some old home decor. We will be moving out at the beginning of April, so I don't have much time left. I am thinking of redecorating our bedroom once we move and I will probably ditch the gold and white theme and go for a fresher look with pastel blue and and maybe a touch of yellow. I will definitely need new pretty bed linen like the Emma Bridgewater Birds Duvet Cover Set (£90.00). I am in love with the beautiful design and the colours are perfect for the bedroom. I will also pick up some new cushions and cute ornaments to go with the new colour scheme. 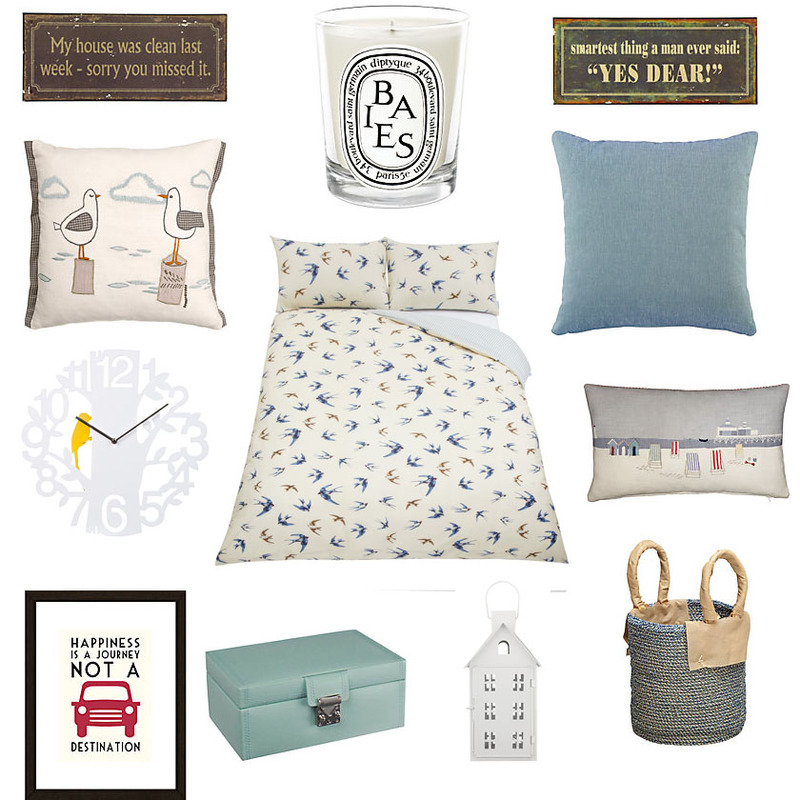 All the items I featured are from John Lewis if you were wondering :) I had a browse through their home section and I am ready for a full bedroom makeover right now. I am also loving the plaques with funny quotes and I will definitely pick them up soon. The white Winston Woodpecker wall clock really caught my eye and I like the touch of yellow on it. I am not sure if I could have it in my bedroom though, because I can't stand clocks ticking. Every time we get a new clock, I take the batteries out and never put them back in, haha. Another thing I really want for our new bedroom is a Diptyque candle. I am not sure what scent I want to buy, but Baies sounds like a nice combination. What do you think about this colour scheme? Do you like a touch of blue in bedroom decor?